Washington DC, March 3, 2014 (Alochonaa): Did you know that the American Dream now comes in the form of a miracle pill? A recent marketing and advertising trend is peddling what they call the “smart pill”, presumably a brain pill that not only makes you smart, it can also make you rich because you optimize your brain capacity! This is essentially a vitamin supplement that claims to boost memory, energy, and creativity, but it can also make you rich, very rich because it allows you to use your head more effectively when making those difficult career and investment decisions. You too can realize the “American Dream” just by taking this pill, without going to college, without working hard, without any effort on your part. Pills and potions have been sold for their “miraculous” powers for centuries, but especially in the last fifty years amid a culture of “therapism”, a trend that assumes the more pills the patient takes the better for treating everything from serious illnesses to shy demeanor in public places. Although I never thought that I would actually see a vitamin supplement peddled as the cure to low IQ, I am even more surprised that the so-called “brain pill” today is promoted by movie stars as having them smarter but also millionaires. If you too wish to become a rich and famous person take the “smart pill” and all your troubles will be behind you. One could understand a pill that makes shy people less so in public. However, a glass of fine red California wine would probably work even better and with tangible benefits for the cardiovascular system. Considering that roughly ten percent of Americans take anti-depressants, it is understandable that despair has driven people to blame themselves. This is not to dismiss the validity of medication when necessary and when prescribed with diligence to save lives and relive pain. Nor is this a critique of the “smart pill” as an enhancement drug that may work to energize the brain, again with the caveat of long term side effects. But is the “smart pill” a catalyst for the fate of Bill Gates, movie star Bradley Cooper, etc. and is it a catalyst for addressing low income conditions in society? Let us assume that the manufacturer of the pill were to distribute it free to the entire population in the world under the auspices of the World Health Organization. Would this end poverty in sub-Sahara Africa, uplift indebted Americans straight into the rich and famous category? As though the “smart pill” were not enough what about a motivational speaker going on TV and arguing that the middle class is shrinking so please get out of the middle class now. How does one extricate herself/himself from the dwindling middle class and rise up to the millionaires club to keep company with Hollywood stars and high tech billionaires? The highly paid motivational speaker replies that you just have to triple your income because America is rapidly becoming the land of rich and poor and you want to join the rich folks. How do you triple your income if you are a) a retiree on fixed income; b) a college student; c) a college graduate in fine arts working at COSCO until that great museum curator job opens up; d) an office worker trying to hang on to your job for another year with an income you need because you husband is working part time; etc. Short of some stroke of luck or illegal activities, you will experience a downward socioeconomic mobility and so will your children in the next three decades because that has been the trend in the last three decades. Not to put a damper on the miracle “brain pill” or on the highly paid motivational speaker, but back in the “real world” of the middle class chasing the elusive American Dream, people endure income inequality that government policies have created because they are meant to concentrate wealth. Notwithstanding, the “smart pill” theory and the motivational speaker who has lifted himself/herself out of the middle class by giving you advice at high cost, the assumptions about why and how one is poor and how one becomes rich are as old as the first Industrial Revolution in England. Once the Industrial Revolution began to spread from England to the continent in post-Napoleonic Europe, scholars, politicians, and businessmen recognized that capitalism creates immense wealth but at the same time enormous poverty, despite the theoretical promise of “general wealth” for all as classical economist Adam Smith argued. The response from the political, business and academic elites in the early 19th century was that the system is fine, in fact “natural” to mankind. If you are not wealthy it is your own fault because you have negative traits such as laziness, alcoholism, bad behavior etc., you are ignorant because you lack an education, ambition, hard work, and skill/talent. It is important to point out that in pre-unionized workplaces, a worker labored for 16 hours a day six days a week and earned a subsistence wage barely enough to feed a family. Was he poor because of the subsistence wage policy that both business and government demanded must prevail, or because he lacked those fine character traits that are after all determined by the environment in any case, as English philosopher John Locke pointed out in An Essay Concerning Human Understanding? A recent study on the continued shrinking of the American middle class points to some very troubling statistics, among them that the downward socioeconomic mobilization that started in the early 1980s and will probably continue for the balance of the decade. What is the middle class and how does our definition differ from that of 19th century Europe undergoing social change because of Industrial capitalism? US government, the media and mainstream institutions define middle class on the basis of a) owning a home, b) car, c) college for the kids, d) retirement fund, e) health care, and f) family vacations. If you have these six things, you too are in the shrinking “middle class” as US government (and mainstream institutions) defines it. But what if you lack one or more of the six criteria and what if your income continues to drop in real terms because cost of living is rising? Although Americans like their European counterparts became two-income families, some taking second jobs in the last three decades, the cost of living has been rising, while wages, salaries, benefits, and social security income could not keep pace. Income distribution is such in the US that no study see an improvement, while all studies point to Asia and parts of Latin America experiencing a rise in their middle classes. By the middle of the 21st century, the BRICS nations – Brazil, India, Russia, China and South Africa – will have more than half of the world’s middle class while the US will continue to experience downward socioeconomic mobility in the absence of a major shift in the fiscal system, labor and social policies that will redirect income from the top 10 percent of the population to the bottom 90 percent. While the BRICS combined have the majority of the world’s poor today, the economic power shift from the US and EU will mean that the BRICS will account for most of the world’s expanding middle class by the end of this century. This does not mean that the American middle class will disappear any more than the European middle class disappeared after the Great Depression and World War II. The issue of the shrinking middle class is not just about how the economy will become increasingly distorted because consumption power will be decreasing. Nor is the dwindling middle class about the distortions this would cause in the tax system that would have to change. As middle class incomes stagnate, this sector of society will be making lower contributions to fund government spending in everything from defense to social security. This may entail higher indirect taxes that falls disproportionately on the mass consumer. The issue of course is not only about the withering middle class but the survival of democracy, at least as democracy as the two political parties have been promising the American people, if not as Thomas Jefferson saw it. Will American democracy slowly lapse into some kind of a semi-authoritarian system that will continue to call itself democracy in name, and it this future prospect already here? I have argued in a number of articles that quasi-police-military state is already here and democracy only means the right to vote for pre-chosen candidates representing basically the same policies furthering the interests of the upper income group. America is facing 76% of the middle class subsisting from paycheck to paycheck and the average person is carrying $84,000 debt or double of what it was thirty years ago. This would not be the case of the top one percent of the wealthiest Americans were not earning 300 times more than the median household income that dropped from $73,000 in 1983 to $57,000 in 2010. For income inequality to stay at pre-1980s level median household income would have to be double its current level. The corresponding thirty-year period when median household incomes dropped, the top 1% of Americans saw their personal wealth almost double from $9.6 million in 1983 to $16.4 million in 2010. That 60% of American households earn less than 50% of the gross income, roughly 30% have zero savings, and another 43% have enough savings for three months is a reflection of a society with very serious socioeconomic problems. It is one thing for EU debtor nations under austerity from Greece to Portugal having a third of their population on the edge of poverty and entirely another when 37% of Americans have credit card debt that equals or exceeds their emergency savings. Policymakers have been proposing all kinds of solutions ranging from strengthening the corporate sector even more at the expense of labor. Defense spending that takes away from civilian economy combined with a fiscal policy of transferring wealth from the middle and lower classes to the top ten percent is the reason for the erosion of the middle class. Under Keynesian policies from the Great Depression until Johnson’s Great Society the American middle class expanded. It began to contract as the Keynesian system eroded owing to government decisions to keep the military industrial complex strong and keep a strong corporate welfare system that maintains an elite financial class increasingly wealthy at the expense of the middle class. 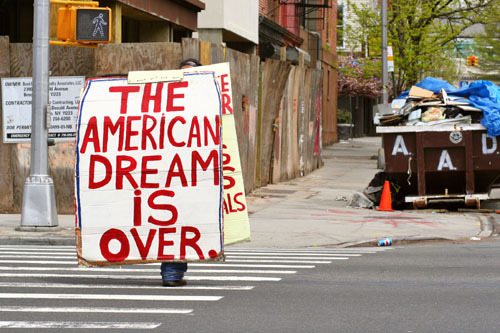 The Obama administration remains concerned that the American Dream is fading because the middle class is weakening. Arguing that the “middle class dream” (synonymous with the American Dream) is fading fast, the Obama administration has a task force operating on the assumption that “everyone wants to and can be in the middle class.” Will the “smart pill” and motivational speakers, secular or religious, help society with the many complex problems in the future? Is income redistribution the answer? The only acceptable solution for US government and mainstream institutions is: a) find another job to supplement your income, b) work harder, c) plan and invest better, d) return to school for more education or re-training; and e) wait for “lady luck” to ring your doorbell because you have conformed to the Calvinist work ethic! If indeed the assumptions of the US government (and the entire mainstream institutional structure) that “securing a middle class” is the key the American Dream, how do we explain US public opinion polls indicating that the “happiness” level (granted the obvious difficult of quantifying it), has been under 50% and steadily declining since the late 1970s? Even if we accept the US (political and financial elites backed by media, and private consultants) ubiquitous PR campaign, to project the image that upward mobility is the dream achievable under capitalism under the current neo-liberal model, scholarly studies by individual academics and think tanks for the last three decades indicate that there has been downward mobility in America, spreading to Europe. Global outsourcing under neo-liberal policies has resulted in a shrinking middle class likely to shrink more in this decade in the US and EU. In March 2009, I issued a posting on Stanford University’s World Association for International Studies entitled “Twilight of the Middle Class” where I argued that the middle class in most of the world has been created on paper owing to the credit economy. When I presented the same point in spring 2010 as a guest speaker at a Greek university conference dealing with issues of international political economy and IMF austerity, no one in the audience was surprised that indeed the middle class was built on a mountain of debt under an unsustainable global (public and private) credit economic structure designed to keep wealth concentrated. People know where they stand versus the image they project, a dream that the political and financial are projecting while constantly working to make the social pyramid even narrower. The larger question today is should the six-point criteria developed by individuals who want to perpetuate consumerism be the basis of the American Dream, or should there be a re-examination of peoples’ values in the wake of this prolonged global recession and I mean all people, not just the middle class that constitutes the popular base of bourgeois political parties? Are these the values America wants to continue exporting to the rest of the world so it can strengthen finance capitalism at the expense socioeconomic chasm and social polarization from which arise extreme right wing elements? Is the essence of humanity predicated on the six points mentioned above? In the US government report, there was no mention of creativity, no mention of empathy in thought and deed for one’s fellow man, no mention of protection of nature, no mention of philosophical/spiritual self-reflection, no mention of greater social equality or collectivist action that alleviates suffering of the vast majority, no mention for lessening societal and institutional violence. America is becoming more polarized, and Europe is following in its footsteps. At 4% of the world population, the US consumes roughly one-quarter of the world’s resources. However, a mere 1% of the population owns 35% of the wealth. Is there a future for a growing middle class, the realization of the American Dream and the avoidance of sociopolitical polarization under such wealth concentration? There cannot possibly be middle class growth in the absence of raising living standards of the working class by raising the minimum wage and offering more benefits, especially health insurance. Only government policy from fiscal measures to a pro-middle class and pro-labor regime can reverse the current course where wealth will become so concentrated that it will cause an even deeper and longer recession during the next cycle that I would argue is coming in the 2030s, one century after the Great Depression. This is not inevitable, if the US as well as the governments of the world’s strongest economies do something about grossly uneven income distribution. In the absence of such a policy reversal that only favors the very rich the capitalist system will suffer a serious blow even more devastating than in the 1930s. It is really the epitome of absurdity that the mass media promotes “miracle cures” while at the same time it rarely focuses on the hypocrisy of the inexorable relationship between the political and financial elites. In a report about the relationship between campaign contributions and fiscal policy favoring the very rich, it became public that Illinois Republican Governor Bruce Rauner has proposed slashing programs for the middle class and the poor, while he personally – as one of the richest men in ILL – and the state’s top income earners benefit from his fiscal policy that essentially redistributes wealth from the lower and middle income groups to the rich. It turns out that Illinois millionaires have made millions of dollars in cotributions to the governor’s campaign. In turn, Rauner will use the millions of his contributors to run ads against his opponents who question fiscal policy redistributing wealth from the lower and middle class to the rich. No miracle pill for Rauner and his millionaire contributors and no motivational speakers, just the color of money. Of course, in desperation, people could continue paying money to motivational speakers and try to become rich turning over real estate, day trade on the stock exchange, or speculating on commodities and gold. There is also the magic pill that accounts for movie stars and billionaires, although the side effects of the pill are not known because not enough studies have been done on this. There is also prayer to your local church or temple so you can have a different fate. While all of the above may solve your individual problem, at least make you feel better that you tried, the continued decline of the middle class will remain a reality as will the political and social instability that will invite among the general population that is increasingly outside of the mainstream. We live in a world of solutions that come in the form of a pill, or in a speech by some celebrity speaker who claims that magically you too can be transformed into another person, or in a minister of the church who asks that we keep the faith in God who loves all His creations, and after all the rich are not happier than the poor who will inherit the Kingdom of God. As if this were not enough, we have the politicians promising the moon to all only to deliver it to the privileged elites, and the commercial media essentially echoing whatever the politicians, businesspeople, pill pushers, motivational charlatans and others are peddling to line their pockets while the middle class dwindles and the working class becomes poorer. Change for such a world will not come in a pill bottle, from a charlatan’s speech or from the Heavens. Grassroots problems can only be solved through grassroots solutions. The 21st century is not about “Messiah politics”, but about small practical steps that will eventually lead toward a larger solution if enough people are involved in determining their own fate. *Jon Kofas is a retired Professor . He has published many works including; Independence From America: Global Integration And Inequality, Under the Eagle’s Claw: Exceptionalism in Postwar U.S, Greek Relations and The Sword of Damocles, and The IMF, the World Bank, and U.S. Foreign Policy in Colombia and Chile, 1950-1970.